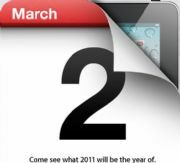 With Apple's iPad 2 event less than 48 hours away, the rumor mill is spinning faster than ever. What's the wisdom of the Web predicting? A thinner, lighter iPad with at least one camera and beefier hardware. The consensus is that iPad 2 will be more of an evolution than a revolution from the original iPad, of which Apple has sold more than 15 million. As usual, Apple has been disciplined about not releasing any information before their big press event. That has led the Web to spend much of its time digging, speculating and daydreaming about what may be coming. Some of the rumors make more sense than others, but as always, you should take them with a pinch of salt. A thinner and lighter iPad 2 is almost a sure bet. Apple likes to shave the fat off its mobile devices with every iteration, and with complaints that the iPad can be too heavy when held up for a longer time, a more svelte iPad 2 is very likely. Also, brace yourself, as there might be a white version of the iPad 2 as well (though given that the company still hasn't managed to ship a white iPhone, a white iPad may be too much to hope for). The iPad 2 could also have a slightly thinner screen bezel, though the screen is likely to remain unchanged at 9.7-inches. A flat back design and larger, stereo speakers are also very likely developments for the iPad 2. Despite previous rumors, the consensus seems to be that there won't be a Retina display on the iPad 2, but rather a screen that matches the original iPad's 1024x768 resolution. It's very likely Apple will integrate a front-facing camera on the iPad 2 so users can do video chats. But opinions are split over whether we will see a camera on the back too. Other likely hardware changes include a faster A5 dual-core processor and 512MB or 1GB of RAM, as well as a dual-mode GSM CDMA chip inside the 3G iPad 2. The original iPad has a 1GHz A4 processor and 256MB of RAM. Less likely hardware developments on the iPad 2 include the rumored SD card slot, a Thunderbolt port , or even a carbon-fiber body. It's likely that the iPad 2 will cost what the original iPad costs now. The original iPad is likely to become a value sidekick to the iPad 2, sold at a lower price (though Apple is expected to stop manufacturing the original tablet once the new iPad appears). On the software side, the iPad 2 is likely to introduce iOS 4.3, which brings news subscriptions, extended AirPlay support, and many other improvements. Evidence of FaceTime and Photo Booth apps has been uncovered so far, and some speculate Apple could also introduce an iLife multimedia editing suite on the iPad 2, taking advantage of the camera (or cameras) on board. What would you like the iPad 2 to feature? Sound off in the comments.